Tired of your drab and dated kitchen? We take your existing cabinetry and transform it with a beautiful new and custom finish! You can have those trendy white or colored kitchen cabinets you’ve always wanted! With thousands of colors, glazes, stains and techniques to choose from, we customize each kitchen into a work of art! We take your outdated or dingy bathroom or kitchen cabinets and transform them into something you can be proud of for a fraction of the cost of replacing them. 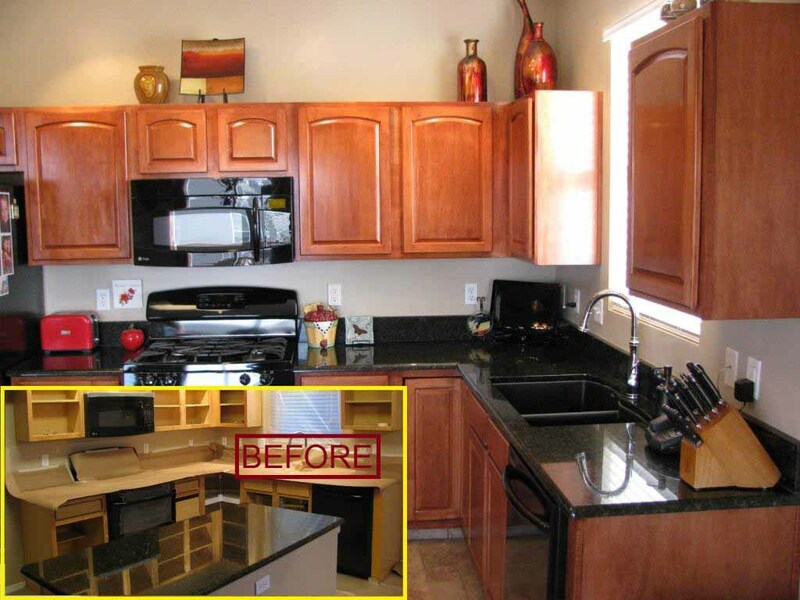 Let Scott's Painting & Staining Inc. transform your cabinetry! After carefully preparing, sanding and cleaning your cabinets or shelves we can paint over any existing stained or painted finish on your cabinetry or woodwork to your desired color. We offer multiple options and finishes, including Oil-Based and Latex-Based paints using cabinetry grade enamel paints. Depending on the type of finish that works best for you, we offer in-house masking and spraying of built-in shelving or cabinet stiles. Doors and Drawers can be finished in a different area or off-site for your convenience. Transforming your existing stained cabinetry or woodwork color and changing it to a lighter or darker stain color. We offer various color enhancement techniques and we can refinish your cabinets in the same color by restaining worn or distressed area prior to applying a new clear finish coat. We clear coat with a cabinetry grade clear coat finish. The clear finish can be sprayed or applied by brush/roller. Can you use a custom color? Answer: Yes. We can provide thousands of color samples but any custom color can be created or matched from a sample. How long does it take to completely finish my cabinets? Answer: This depends on the size of kitchen and the type of refinishing project we are doing, it could be finished in as little time as a week. Bigger and more customized projects can take a little longer. Ultimately having a beautiful final product dictates the length of the project. Answer: Yes. We can repair minor damage on doors and drawers. We can install crown molding and other finish carpentry work. Answer: Yes. All of our estimates are free. We want the opportunity to come out and show you what your new kitchen can become, you will not be disappointed! Are the cabinet doors removed? Answer: Yes. The doors and if possible, the drawer fronts and end panels are removed. The existing frames, stiles or boxes are finished onsite. We carefully cover all of your existing fixtures in your home. Do you apply a finish to the inside of the cabinets? Answer: Normally, No. We finish the interior lip of the cabinet. If there is a glass door, we can spray the interior. Refinishing the inside adds to the cost and is not normally required. Do I need to remove items inside of my cabinets? Answer: Yes, we ask that you remove everything inside the cabinets. We thoroughly seal off the box openings, but we don’t want any risk of overspray on your shelves. Can you install new hardware? Answer: Yes, if you pick out your own handles or knobs, we can install them for you. Do you laminate kitchen cabinets? Answer: No, we offer cabinet staining, painting & refinishing company. Laminate is a completely different process which we do not perform. Answer: Yes, we do! We can refinish various pieces of furniture from dining room chairs and tables to church pews.